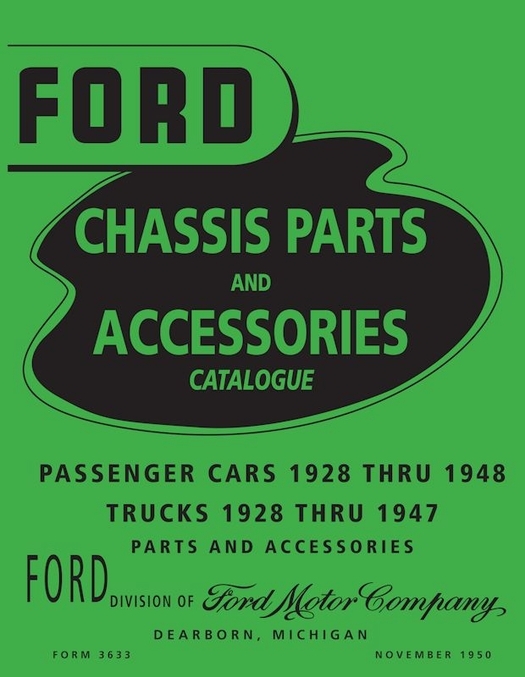 The OEM 1928-48 Ford Car / 1928-47 Ford Truck Parts Book is a high quality authorized licensed reproduction of the Master PARTS manual published by Ford Motor Company for its dealership mechanics and parts departments. 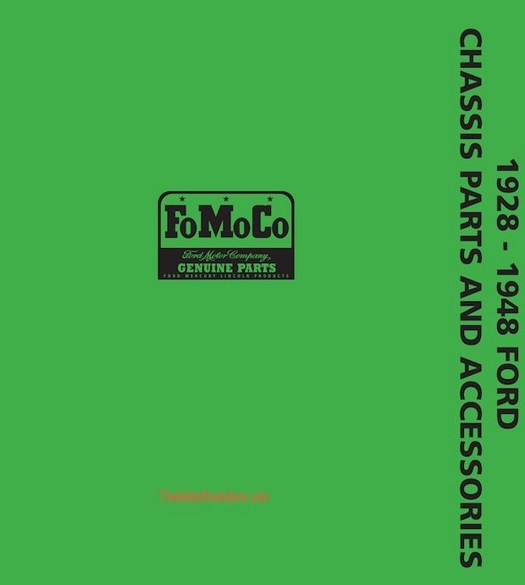 In the automotive reproduction and restoration industry, it is more commonly referred to as the Green Bible for vintage Ford Car and Truck parts. Part Numbers are grouped according to their function, e.g. 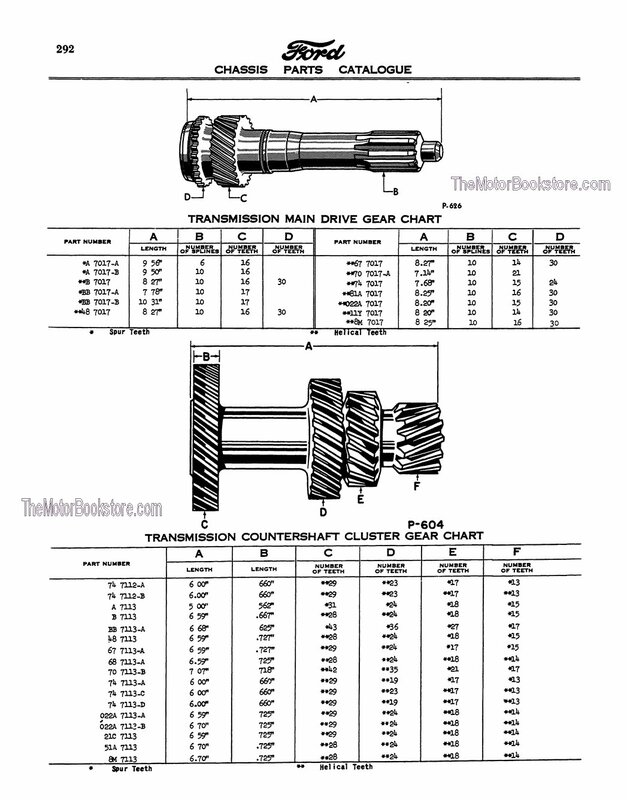 Steering Gear are grouped from 3503-3743, Starter Motor from 11002-11383, etc. Chapters are arranged by groups. Detailed assembly diagrams of components such as fuel pumps, distributors, etc. promote rapid part identification. Charts below diagrams provide additional part information referred to in assembly diagrams. Illustrations throughout the catalog are for a specific model, however, the basic part numbers apply to practically all models. 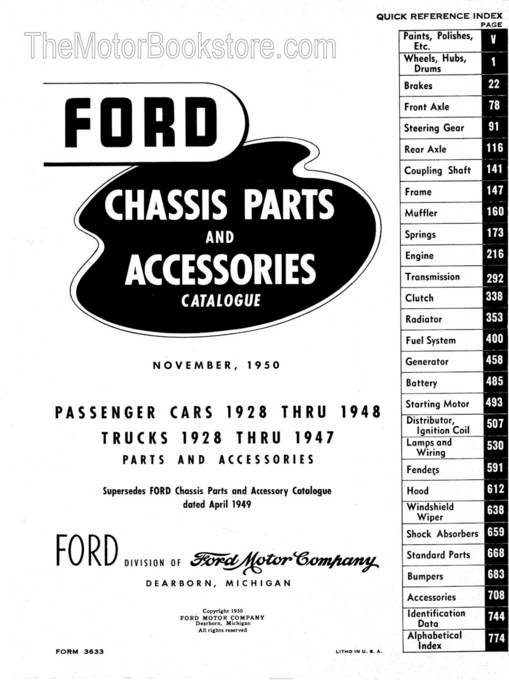 The 1928-48 Ford Parts Catalog will definitely help the mechanic or restorer order the right parts for their vintage Ford. It also is an excellent tool for parts interchange details. The FORM 3633 OEM reproduction includes 808 pages of detailed parts information for the majority of vintage Ford subsystems including engine, transmission, brakes, bumpers, fenders, fuel system, generator, rear axle, front axle, frame, suspension and much, much more. Refer to the Table of Contents tab to learn more about this book's contents and organization. NOTE: This catalog does NOT contain detailed parts identification of the body parts. Refer below for specific models covered. This parts catalog will surely become the most important tool in your toolbox - we are sure of it. This manual is perfect for the restorer or anyone working on one of these vehicles. Clear illustrations show exploded views along with part numbers, part number cross-referencing, part assembly, and more. Below: 1928-1948 Ford Car, 1928-1947 Ford Truck Parts Book (Green Bible) Sample Page. Copyright Ford Motor Company. Ask a question about 1928-48 Ford Car / 1928-47 Ford Truck Parts Book. This book is a must for restoration projects. I advise obtaining before purchasing any parts, for a project.